Glary Tracks Eraser is a powerful tool that can help you secure your privacy. It allows you to erase common Internet and computing tracks, including browser cache, cookies, visited websites, typed URLs, recent documents, index.dat files and more. Glary Tracks Eraser makes life much easier by taking care of everything at the click of a button, freeing up wasted hard drive space and getting rid of your past activity records from the PC. 1. The Above Red Area: shows the number of privacy problems found and allows you to rescan problems, as well as erase checked tracks from your PC. 2. Left-hand Side Button: allows you to select the needed sections to scan tracks. 3. Right-hand Side box: displays the summary of problems found. For the one you do not want to erase, do not check it. Just choose the right one you need to clear, and click "Erase checked tracks" in the upper box of the main window. 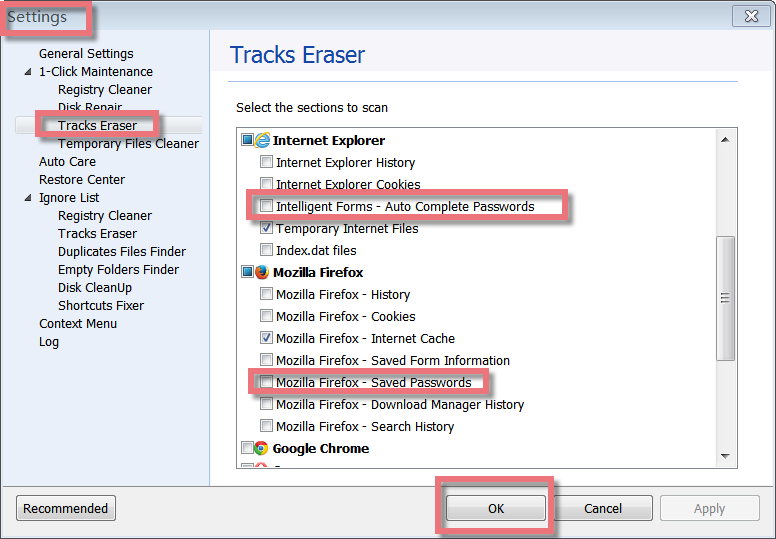 If you want to keep passwords on your PC, please do not check the box on passwords in IE, Firefox and google in Tracks Eraser. You can find Menu--Settings--Tracks Eraser, do not check the entries on passwords. Or on Overview page, if you are the Pro user, when you check up on "erase privacy tracks on windows shutdown"--choose "select tracks", in the new pop-up window, please do not check the box on passwords. However, if you clear some cookies, it may still clean your passwords. 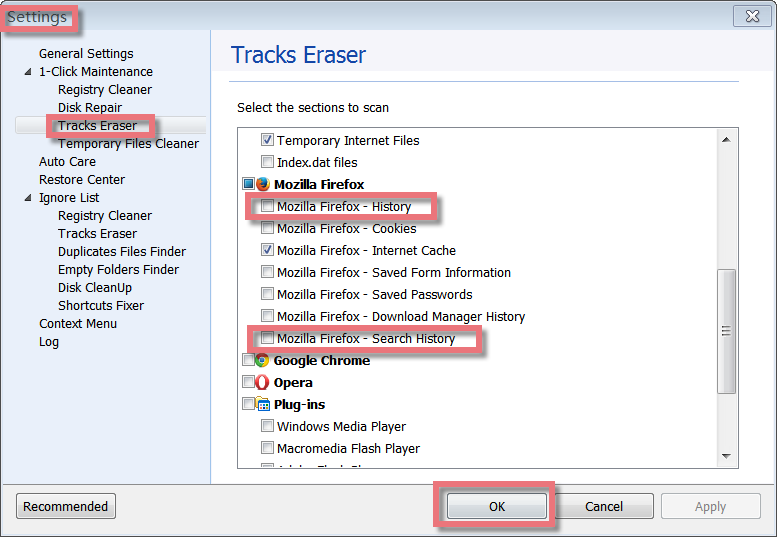 To clear Firefox history, please check those items: Menu--Settings--Tracks Eraser, you can check the entries on Firefox history. Or on Overview page, if you are using the Pro version, when you check up on "erase privacy tracks on windows shutdown"--choose "select tracks", please check the box on Firefox history in the new pop-up window. Cookies are created when you browse some websites, and other websites that run ads, widgets, or other elements on the page being loaded, so you'd better remove these cookies. However, you regularly contact some cookies that link with your bank and other regular network address so that you can keep those cookies. Here you can set Glary Utilities to stop cleaning some cookies so it does not remove the 'links' that you wish to have remaining on your PC. Please click "Edit", choose Options, and then check up the cookies you want to keep, finally click OK button. If you want to exclude an item from being erased by Tracks Eraser, you can directly add it to the Exclude List. 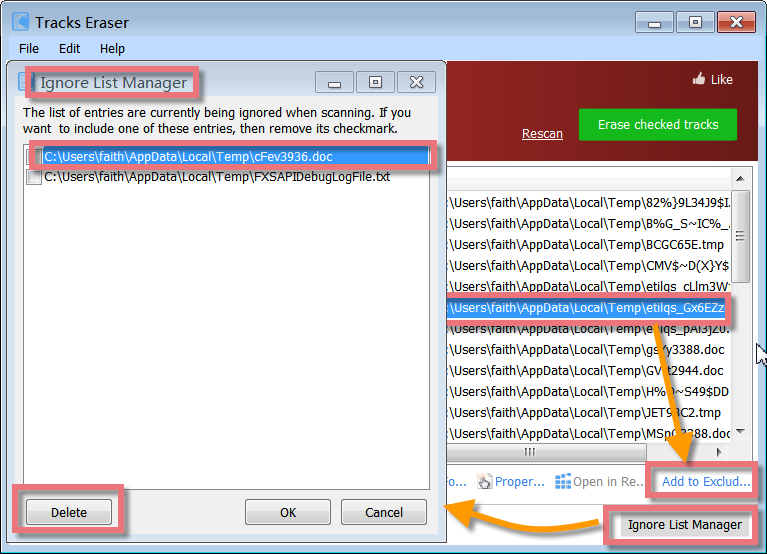 Items included in Ignore List won't be scanned and erased when you are running Tracks Eraser. When the software update becomes more stable on performance, you can just delete it out of the Ignore List. Click "Ignore List Manager", find the needed entry, and then delete it. Tracks Eraser should be used daily before you shut down your computer. Regular use of Tracks Eraser will ensure the protection of your personal information from strangers. When you leave your computer unattended. When you feel like using it. Tracks Eraser is very simple to use. 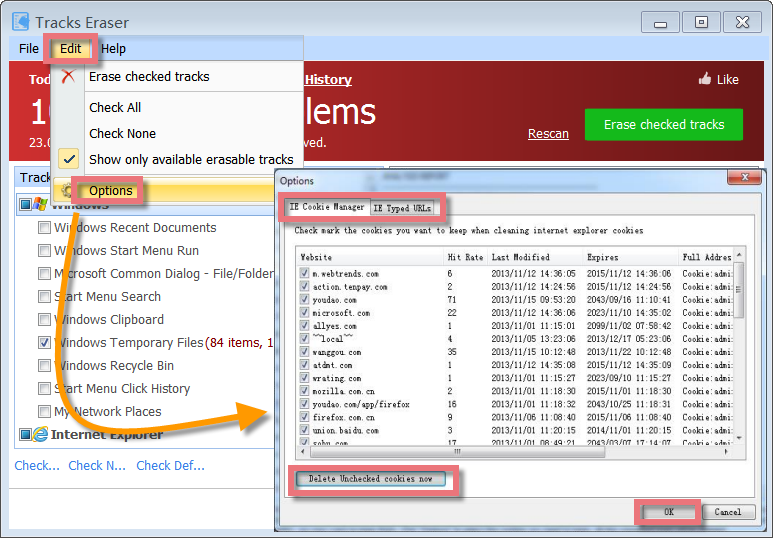 When you start Tracks Eraser, it will automatically to scan privacy problems. You’d better close the browser you are using before you clear your personal information. Just check mark items which you wish to erase and press 'Erase checked tracks' and you are ready to go. 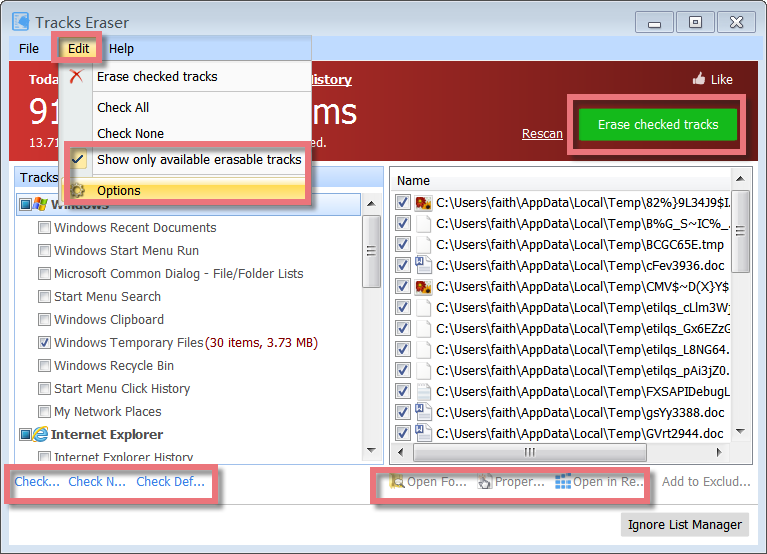 As soon as you press the 'Erase checked tracks' you will see the window shows what it is currently cleaning up. Generally clean up could finish in a few minute. "Check All": Check all tracks in tracks lists. "Show only available erasable tracks": Hide the item that is not installed on your system. "Options": Manage IE typed URLs and cookies. You can select those cookies or URLs which you want to keep, and delete the rest. To select a cookie, check mark the box beside it. To deselect, uncheck it. By default, all cookies are deselected. Click "Erase history" under Privacy, Tracks Eraser will pop up. Find and click Tracks Eraser icon, Tracks Eraser will appear. Please note: if you want to add Tracks Eraser in the Dock bar, click in Dock bar, remove any icon by dragging it out of the Dock firstly, and then drag Tracks Eraser in.